"These cookies are no fail and taste so good!" This recipe is great for crunchy cookies. 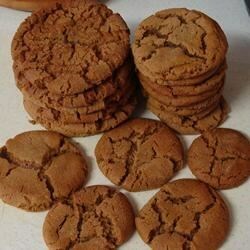 If you want a chewier cookie (that's how we like them) only bake for 8minutes. Add a 1/4 tsp. of cloves too! Yum! Wonderful cookies, Sherry. For personal taste I added 1/2t more ginger and 1/4t cloves for a lttle extra kick. As they baked, they emitted an aroma to die for. Thanks for sharing.